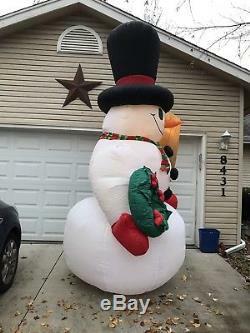 For sale is a gently used and greatly loved 12.5 12/12 foot inflatable Snowman from Gemmy Airblown Inflatables. Includes anchor stakes, tether stakes, tether ropes and 2 additional lightbulbs. 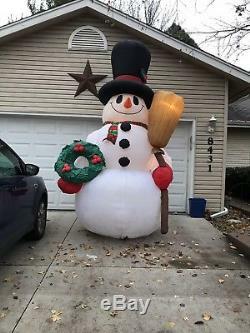 Gigantic happy smiling snowman wears a black top hat and red and green scarf. 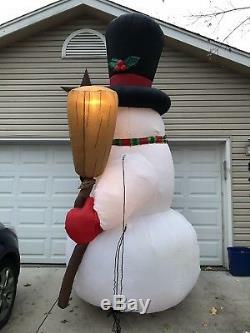 He holds a broom that lights up and has a large green wreath. Complete with a carrot nose and coal buttons, he will be a terrific addition to your outdoor holiday decor. 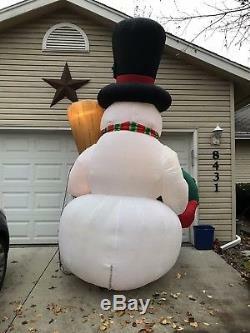 The item "CHRISTMAS Airblown Inflatable SNOWMAN 12.5 FT Inflate and Celebrate" is in sale since Sunday, November 4, 2018. This item is in the category "Collectibles\Holiday & Seasonal\Christmas\ Current (1991-Now)\Yard Décor". 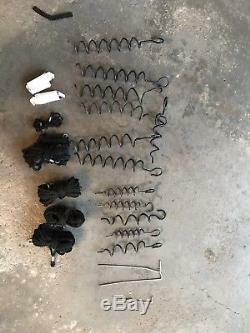 The seller is "tigger50265" and is located in Urbandale, Iowa. This item can be shipped to United States, Canada, United Kingdom, Denmark, Romania, Slovakia, Bulgaria, Czech republic, Finland, Hungary, Latvia, Lithuania, Malta, Estonia, Australia, Greece, Portugal, Cyprus, Slovenia, Japan, China, Sweden, South Korea, Indonesia, Taiwan, Thailand, Belgium, France, Hong Kong, Ireland, Netherlands, Poland, Spain, Italy, Germany, Austria, Israel, Mexico, New Zealand, Philippines, Singapore, Switzerland, Norway, Saudi arabia, Ukraine, United arab emirates, Qatar, Kuwait, Bahrain, Croatia, Malaysia, Chile, Colombia, Costa rica, Dominican republic, Panama, Trinidad and tobago, Guatemala, El salvador, Honduras, Jamaica, Antigua and barbuda, Aruba, Belize, Dominica, Grenada, Saint kitts and nevis, Saint lucia, Montserrat, Turks and caicos islands, Barbados, Bangladesh, Bermuda, Brunei darussalam, Bolivia, Egypt, French guiana, Guernsey, Gibraltar, Guadeloupe, Iceland, Jersey, Jordan, Cambodia, Cayman islands, Liechtenstein, Sri lanka, Luxembourg, Monaco, Macao, Martinique, Maldives, Nicaragua, Oman, Pakistan, Paraguay, Reunion.